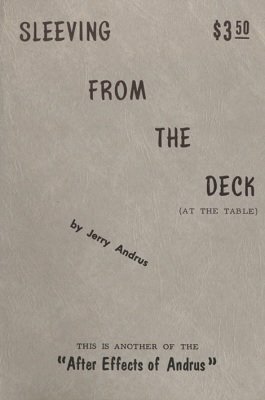 When my first ideas on sleeving from the deck were published in Andrus Deals You In in 1956, they must have looked a little weird to those unaccustomed to the ways of Andrus. I heard of various comments from "Impossible," to "This guy's crazy." Being a magician, I cannot fully deny the second, but the first has been well proved in my utilization of the sleeving move on many occasions. Sleeving From The Deck is another of the after effects of Andrus Deals You In . While the method put forth in that book was practical (in spite of its looking reasonably impossible to some) and was considerably used in my magic, there was still much room for further thought in the field. The new sleeving technique in this book, Sleeving from the Deck , represents the new material that I have come up with in this field since Andrus Deals You In . Some of it I have been using for several years and feel that it is one of my most potent weapons. 1st edition 1961, 18 pages; 1st digital edition 2015, PDF 16 pages.